In Brighton sunglasses, Nancy plays with a kid on her husband's farm. 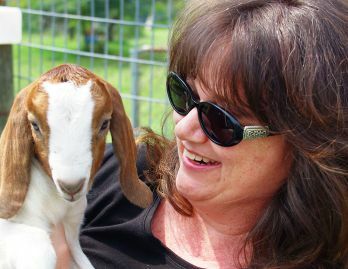 She writes and works full time from the 76-acre goat farm in Drewryville, Virginia. 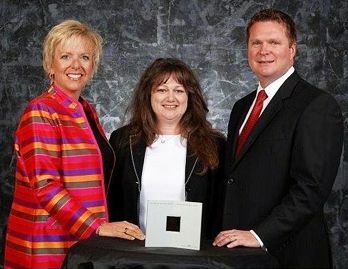 A senior vice president at Bank of America, Nancy won the bank's prestigious Award of Excellence in 2006 for her performance and values. Nancy's busy schedule includes author events throughout the country. She is releasing three new novels in 2013. 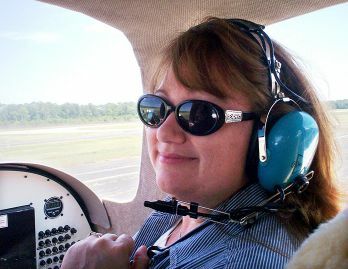 Nancy won the bid to pilot an experimental plane at last year's Brenda Novak Auction. She donated Brighton accessories to this year's fundraiser. Flying home from an event, Nancy stopped at the Charlotte airport Brighton to buy a Mother's Day gift for biggest fan -- her mom. Looking through her email one day, Nancy Naigle finds one of those anonymous quotes people circulate on line. She chuckles as she reads, "Live your life in such a way that every single morning when your feet hit the floor, Satan shudders and says, ‘Oh s--t, she's awake!’"
She saves that quote, since it’s such a perfect reflection of her personality and outlook on life. Besides a successful banking career, Nancy fundraises for charities, supports a wide community of friends and provides a little escapism through her entertaining fiction. Years later, the quote becomes part of the opening line of her first published novel, Sweet Tea and Secrets. 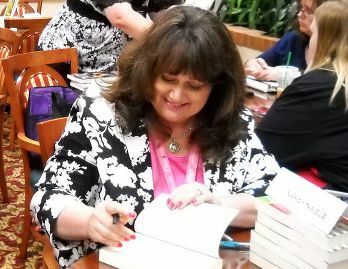 By traveling to book events, Nancy has the opportunity to meet fans and catch up with fellow authors. In 2003, Nancy begins to focus seriously on her dream of becoming a published author. “When I turned 40, I knew that if I really wanted to achieve that goal, I had to get busy,” she says. She joins the Romance Writers of America and finishes her first novel the following year. 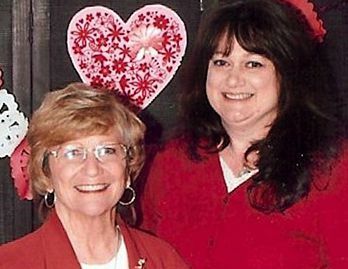 Once in the loop of romance writers, Nancy meets authors who have become some of her dearest friends and/or collaborators. Kelsey Browning, Tonya Kappes, Tracy March and Jerry Hampton (her second cousin who writes under the pen name Shanon Grey) all marvel at Nancy’s generous support of their projects while juggling so many of her own. In particular, author Brenda Novak holds an online auction every May to raise funds for diabetes research. Nancy has been a category captain for the past couple of years. This year, she reaches out to Bret Michaels, who contributes tickets and meet-and-greet passes to one of his concerts. He’s the inspiration behind one of her characters in Out of Focus, a novel for which she researched the music industry. Instead of following the conventional wisdom to write about what she knows, Nancy writes about what she loves. Lucille Ball famously said, “If you want something done, ask a busy person to do it.” Nancy certainly proves that “the more things you do, the more you can do.” However, she doesn’t “multi-task,” where people do two things at once, neither of them well. She focuses on accomplishing a specific task in whatever time she has. “I can write two pages in a 20-minute sprint,” she says. The key is not to let those 20 minutes pass unproductively because it doesn’t seem time enough to get anything done. One of her favorite ways to “make time” is to shop at airports between flights. In particular, she frequently visits Brighton Collectibles at the Charlotte airport for her favorite accessories. On her way home from a Milwaukee event recently, her connecting flight in Charlotte is delayed. She happily takes the opportunity to buy a Mother’s Day gift for her mom, who is her best buddy and biggest fan. Over the years, she’s learned to relax about life and the future, even trade-marking the phrase “Read. Relax. Repeat.” She sees that when life gave her lemons, she made lemonade with Sweet Tea and Secrets. When flights are delayed, she can go shopping. As her character Pearl Clemmons would say, “Here’s the good thing about the future. It comes one day at a time. Follow your heart each day. You’ll get where you’re supposed to go."